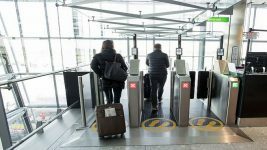 The key to automated border control is biometrics as this can be used to uniquely identify every passenger. Biometrics is the measurement of physical characteristics and behavioural mannerisms of the human body with the aim of identifying definitely a person. Simply put it can help authorities check that a person is who they claim to be. How does Automated Border Control work? A biometric sample is taken from the passenger at Immigration and compared against data stored in a central database, or on a Machine Readable Travel Document (MRTD), or on a smart card. There are a number of versions currently in use with the most popular seeming to be facial recognition against the biometric in a MRTD (usually an ePassport). Australia has a system called Smartgate. It uses a MRTD and facial recognition. Passengers with an ePassport scan the ePassport at a self-service kiosk. The kiosk determines if the passenger is eligible for Smartgate. If so they are issued with a ticket. They then move onto the gate and insert the ticket. A digital camera takes a picture and compares it with the face in the ePassport. Why use Automated border control? 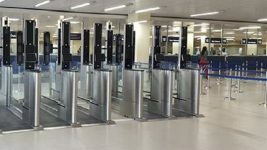 The number of passengers using automated border control will increase as more passports with biometric information are issued. Passport control will be a more efficient process in terms of processing the total number of passengers and should result in reduced queue times for some passengers. Like check-in kiosks, automated immigration can free up staff for more productive and satisfying work. Some charge making it more of an elite offering. Many countries and even airports within a country have different processes.